When the weather is hot and Dry the Evaporative outdoor AC (air cooling machine) gives best performance. However, when the weather is extremely humid, the Evaporative air cooler or outdoor AC can’t do much more than moving Air. Or you can support it by feeding ice cubes into the water tank to get cooler air. Since Evaporative cooling is related to humidity level, the following chart shows how much cooling you can get from evaporative Air coolers based on Outside ambient air temperature and humidity. Here is the Bad news , as we all know Dubai weather is humid, so you can’t Expect much from evaporative cooling during the most humid month. But since Air coolers can move a lot of air, you can get in addition to cooling from Evaporative cooling , you’ll feel more cooling from the huge air flow fan. The best thing about Evaporative air coolers that they use much less energy than conventional air conditioners, and can provide much more air flow. Actually for outdoor cooling application there is no better way to do it than Evaporative cooling, because the need of huge air flow in open areas. 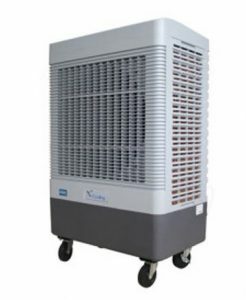 On the other hand, for Indoor cooling, temporary cooling or spot cooling, The conventional portable AC is best option to go. This applies to backup data center or tent cooling which is a common in Dubai and other Emirates. June 6, 2018 June 7, 2018 adminHelp?